For 2009 the Lexus IS receives subtle styling revisions to the exterior. A new rear suspension has been employed for all models, and the steering has been retuned for improved steering feel and control. In addition, advanced dynamic handling technology is now standard across the line. 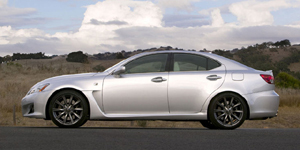 The 2009 Lexus IS Sedan is powered by a base 2.5-liter V6 with 204 hp. Other available engines include a 3.5-liter V6 with 306 hp and a 5.0-liter V8 with 416 hp. Find the used Lexus IS of your choice from a dealer in your area. Search our used car listings now.